On this account you can find vanilla minecraft stages in best quality with much different cool functions. I play Minecraft since 2012 and love it to build stages with much redstone functions. My birthday is on april 27th. I'm thankful to everyone who is helping me with this great support! ► Released Katrah Open Air Festival 2017 Download link and trailer! Download the map here and watch the trailer here or on the project site. ► Posted Katrah Open Air Festival 2017! Download coming soon! Click here to visit the beautiful Katrah 2017 and see the pictures! ► Katrah Open Air Festival 2017 Beta Testing Phase ended! ► Released the Katrah 2017 Teaser Video! Smaller updates are not shown! I have some really sad news. As you might know I have'nt posted here since a while now. That has a reason. I am currently working on a game called Stage Simulator. Also I'm in education for a job now. I don't have that time to work on both projects. I decided to get all my concentration on Stage Simulator. But that does not mean that I'm totally get away from building things in Minecraft. It does just mean that I will take a little break. I don't know when I will come back. Guys, as I'm writing this I'm crying a bit because just think about what we did in these years. It was awesome. You were awesome! You are the best community I can imagine and I wish best of luck to you all. We reached so much. We revolutioned Minecraft Festivals on a whole new level and I never made it without the help of you! Just thank you guys. But life goes on. Katrah will not further be updated. I don't know if there will actually be Katrah 2018 but I don't think so. But as I said maybe I will come back and this comeback will be huge if this actually would happen. I can just say. I love every one of my subscribers here. You guys supported me so much. I wish you all the best and have a nice summer! Feel free to follow my game Stage Simulator if you want. It's currently in Early Access. Click here to visit or download it. Hi friends and welcome to this new status update! Let's start with Katrah OAF 2017 download release date!! The release date is official now! The Katrah 2017 download link will be released on 6/8/17! So the Beta Phase has endet yesterday! Hello everyone and let's start straight with this status update! Katrah Open Air Festival 2017! Yes I have not forgotten our loved Katrah Beta Testing Phase which is starting on 5/20/2017 to 5/30/2017. You can send me a message here on Planet Minecraft and I will give you a copy of Katrah 2017 at the beginning of the Beta Phase or while it runs. Please send me a report then if you found any problems on this map. Nothing much to tell because I'm very busy at the time checking all functions and making the Trailer. Yes things happened on my account and I will tell you all the news so let's start. 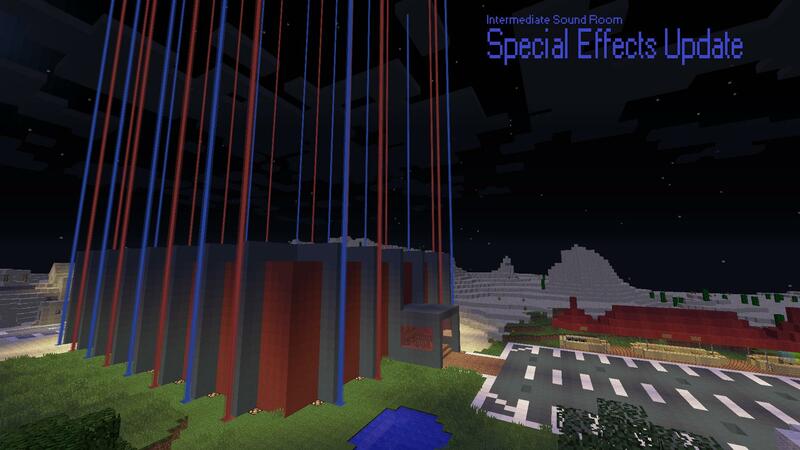 Finally the Intermediate Sound Room is to 100% finished with the brand new Special Effects update which brings particle effects, lasers and more. 100% does not mean that I will stop working on that map. Like on every map: If I get new ideas on a map I will update it further. Can I use your project on my server? my projects are not made for servers. If you want a exclusive stage of mine on your server simply text me via a message here on Planet Minecraft and I can build you one directly on your server but ONLY if I have the time for that. Something very big is in progress but I can't tell you what it is. That's way too early because I really need my time for that project. So I hope I could clear some questions and keep you up to date. What is up folks, welcome to a new status update! Let's start with the upcoming Intermediate Sound Room Update. Congratulations for those people who got a collection! So this event would actually end tomorrow but I will extend it to the 20th of may because there are still people who want to get one and also some I couldn't respond recently. So if you want to have a collection with limited stages and exclusive video material simply send me a message via Planetminecraft and I will giveaway some because the amount of these collections is limited. Good luck! So that's it for this time!